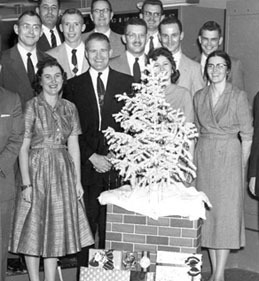 It may look like just another Yuletide scene in an office in 1958, but this one is something special. To help debug the device, the computer engineering team pictured here put in speakers and programmed it to give different tones to distinguish between hardware and software problems. The machine had a limited musical range, consisting of just pitch and duration, over the space of 2 octaves. But over time, the programmers discovered that they could make it play Christmas carols. When The Dallas Times Herald heard the news, they did a story on it, and the photo above was the result. "At some level, this was the world's first iPod," said David Alan Grier, vice president of the Computer Society of IEEE, and a regular contributor to IEEE Computer magazine. Grier was at CERN in mid-December to give a talk on the history and the future of computing; among other things, he said that the fastest-growing technical degree in American higher education is . . . computer game design. "The next generation will come not from hardware engineering or software development but from online game designers." He cited the unlikely connection between an oil industry computer and 'Jingle Bells' as one precedent for such unexpected twists. Grier is also the son of the man in the center of the back row of the photo, and well remembers his own boyhood attempts at tinkering with the machine in off-hours. "I thought that programming on the Univac was cool, and realized I was a software guy (before there even was such a term)." You can hear the full story of the Univac's Christmas Carols on his podcast, "Songs of Comfort and Joy."